It has been a long-acknowledged fact that cities need to improve their public transit systems, both to improve the mobility of their residents and to move away from the greenhouse gas-emitting automobile centric planning of the 20th century. With many cities struggling to see how expensive and intensive transit projects such as subways and light rail can be implemented without the necessary funds in government coffers, existing modes of transit such as the bus have to be significantly improved upon in order to allow for rapid implementation and flexibility without the price tag. Bus Rapid Transit (BRT) is an example of a re-designed transportation method that has achieved a lot of positive press lately. However positive some BRT developments have been, others have not realized some of the basic principles of an effective BRT and have left riders disillusioned with the concept. As Bill Gates recently urged in his 2013 Annual Letter, measuring and assessing our work to improve cities is crucial to invention. A number of cities and organizations have done just that, and their recently released assessments of bus rapid transit systems point to areas of excellence and places where there is room to improve. Bus Rapid Transit, according to the National Bus Rapid Transit Institute (NBRTI), is defined as “an integrated bus-based “rapid” transit system typically utilizing highly-flexible service and advanced technologies to improve customer convenience and reduce delays.” It aims to be a less expensive and more flexible alternative to “LRT” or Light Rail Transit. Several characteristics of BRT systems set them apart from traditional bus transit. First, BRT systems often have dedicated lanes and the ability to skip to the front of the line when waiting at red lights. Their main arteries function as “trunk” lines, with a number of bus routes traveling along popular routes and sometimes meeting up with “feeder” buses that travel local routes. Its stations typically mimic subway stations in their collection of fares before entering the station, automatic doors that open when the bus has arrived and station floors that are flush with bus floors, making for easy boarding and disembarking. Intelligent transportation systems help BRT buses provide accurate scheduling information and prevent “bunching.” Finally, BRT systems are usually branded separately from local bus routes to alert the public to their faster express routes. The first BRT system was built in Curitiba, Brazil in 1974, and became the inspiration for BRT systems in other cities around the world. Unfortunately, a number of bus systems based themselves only lightly on Curitiba’s BRT system while still utilizing the BRT name. Poor outcomes frustrated riders and tarnished the reputation of BRT systems to deliver rapid transportation at lower costs than light rail. Consequently, the establishment of new BRT systems slowed in the 80s and 90s. In 2001, Colombia’s TransMilenio BRT system opened in Bogota, and its high performance characteristics again invigorated hopes that effective BRT was possible. In order to avoid another series of disappointing BRT designs, the Institute for Transportation & Development Policy (ITDP) and Deutsche Gesellschaft fur Internationale Zuzammenarbeit (GIZ) have developed, tested and published a Bus Rapid Transit rating system. Similar to the U.S. Green Building Council’s Leadership in Energy and Environmental Design (LEED) rating system, the BRT rating system version 1.0, released in January 2012, awards varying numbers of points for particular features in five categories: service planning; infrastructure; station design and station-bus interface; quality of service and passenger information systems; and integration and access. In this rating system, projects can lose points for drawbacks such as low commercial speeds, low peak passenger numbers, overcrowding and poor maintenance of buses and stations. 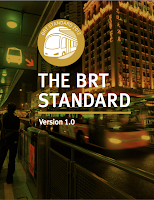 BRT systems are then awarded ratings of Gold (85-100 points), Silver (70-84 points) and Bronze (50-69 points). In order to properly measure the results of the BRT in Guangzhou, ITDP released its Guangzhou, China Bus Rapid Transit Emissions Impact Analysis report in May, 2011. The report states that the Guangzhou BRT system has produced a number of positive results, including a 29% faster trip time for bus riders and 20% faster trip time for drivers in the corridor. This translates into an aggregate annual time savings of 52 million hours, and has been calculated to an economic value of 158 million yuan (over U.S. $25 million). ITDP also estimates that Guangzhou’s BRT will lead to a reduction of approximately 86,000 tons of CO₂ per year over its first ten years and about 4 tons of particulate matter emissions annually. Finally, implementation of the BRT resulted in savings for both the rider and the government. “The BRT’s total capital cost was 950 million yuan (USD 103 million), or about 30 million yuan (USD 4.5 million) per kilometer constructed. This is about one-tenth to one-twentieth of the per-kilometer cost of recent metro projects in Asia.” Additionally, the government’s subsidy has been reduced by 66% from the previous bus system, saving the government over 93 million yuan (USD 14 million) in annual operating costs. At the same time, fares were reduced by making all tickets a uniform 2 yuan (USD 0.30) rather than previous fares of between 2 and 5 yuan based on the length of the journey. The report also highlighted four areas of improvement. First, to address overcrowding on buses and in stations, plans are in progress to upgrade 12-meter buses to 18-meter buses, increasing carrying capacity and ease of boarding. Second, the report highlights the need to reduce the number of buses in the BRT system in order to reduce traffic congestion, as there are currently more buses using the segregated BRT lanes than were originally recommended. Thirdly, most BRT stations are wheelchair inaccessible, creating a major barrier to participation for a segment of the society. Finally, the report found that “a relatively small portion of BRT riders had shifted from other motorized modes: only 1.4% of BRT riders switched from private auto, 3% from taxi, and 11% from metro (which actually has a lower emission factor than BRT).” Thus, it is important to note that the annual reduction of 86,000 tons of CO₂ came largely from converting buses from diesel to LPG, though even the small reduction in vehicle use still equates to 30,000 auto trips avoided daily because of the BRT. The expectation is that as the BRT system expands and becomes less crowded, the system will be able absorb a greater shift from automobiles to bus transit. Expanded spatial operation and improved reliability of bus system. Increased equity in fares between subway and bus riders. Integrated fare system led to an integrated public transport network of community shuttles, buses and subways. Adjusted fares reduced need for municipal subsidies. The exclusive median bus lanes improved bus speeds, punctuality, and vehicular speed in morning hours, as well as reduced the number of accidents. Attempts to reduce the number of unprofitable lines resulted in frequent route closures or changes, thus disrupting the travel of some riders. The fare system is complicated, not well integrated with the greater metropolitan area, and is excessively reliant on computerized equipment. User convenience could be improved at transit centers. Insufficient capacity of median bus lanes and bus stations. 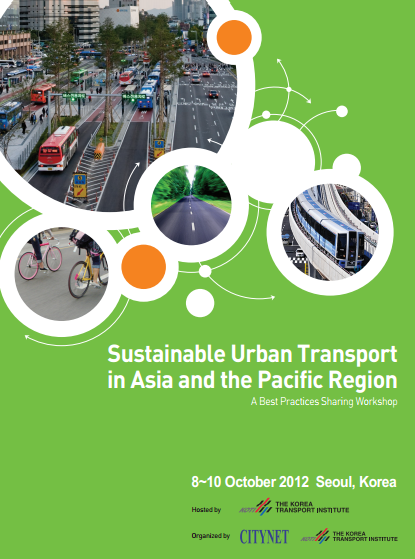 The lessons learned through the bus rapid transit overhaul in Seoul were recently shared at a CITYNET and Korea Transport Institute-organized workshop in which I participated. City planning officials from India, Sri Lanka, Indonesia, Bangladesh, Malaysia and elsewhere were invited to discuss the steps South Korea took to establish its high-class transit system, and how this knowledge could guide the planning efforts of other Asian countries. Representatives of GIZ also presented best practices from around the region. Now that ITDP and GIZ have made significant progress in distilling the best practices of BRT, others are forging ahead with the task of popularizing this method of transportation infrastructure. In March, 2012, the Institute for Sustainable Communities released the report Accelerating Bus Rapid Transit: a Resource Guide for Local Leaders ahead of its Climate Leadership Academy. The report aims to “help local, state, regional practitioners do their jobs better by showcasing effective models and strategies for implementing Bus Rapid Transit (BRT) systems.” It cites the growing challenge to curb greenhouse gas emissions from vehicle exhaust and trends of increasing public transit ridership as primary reasons for promoting BRT in the United States. The bulk of the report is devoted to case studies of BRT planning and implementation in Cleveland, Ohio; Montgomery County, Maryland; Pittsburgh, Pennsylvania; Brisbane, Australia; Springfield and Eugene, Oregon; York, Ontario, Canada; and Chicago, Illinois. Recent interest in and establishment of BRT systems in cities around the world is a positive development, as BRT provides a useful mechanism for increasing the speed and functionality of public transit at a lower cost than subway or light rail. However, past experience and new research has shown that not all BRT systems are perfect. There is room to improve. Furthermore, BRT alone may not incentivize car drivers to switch to public transportation, and should be used in conjunction with other measures to discourage automobile use. Fortunately, we now have an abundance of resources to help determine the best practices and greater considerations for the successful design of future BRT systems.